Hi everyone! this post has been at the back of my mind for a while. 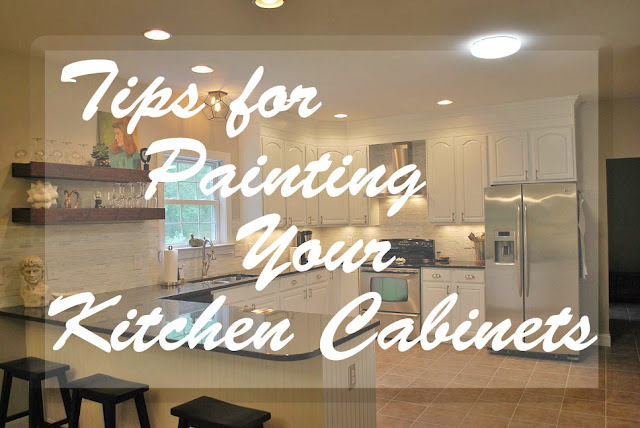 This is the first part of a series, which will include "How-To" tips and videos, and will hopefully provide some extra insight for painting your kitchen cabinets. 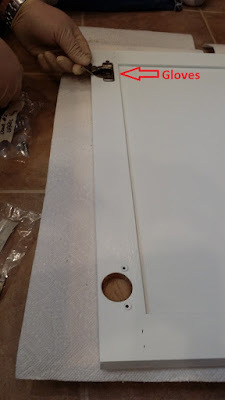 For anyone just joining, I upgraded and painted my kitchen cabinets earlier this year and learned a few important tips along the way that might help some others who are just venturing down that LOOONG road. First, I had a total of 19 cabinet doors and 7 drawer fronts, plus the cabinet framing. That's a lot of d*mn wood to paint! Each door, drawer front, and all the cabinet frames got 2 coats of primer and 2 coats of paint with sanding and cleaning in between. I used Zinsser Bull's Eye 1-2-3 primer and INSL-X Cabinet Coat Acrylic for the cabinet doors. The primer I got from Home Depot or Lowe's and the cabinet coat I got from Benjamin Moore; however, I think the big box stores sell it as well. Third, I worked full time during the day and had to squeeze in doing this between my job and other, regular life issues. So, that being said, it took me a very long time, BUT it was worth every minute and even after a while, it was kind of therapeutic. I also used the VERY helpful painting tips from Erin at Red House Renovation. My inspiration! SO...without further adieu, let's get painting! Cabinet bumpers are those little rubber or velvet adhesive dots that are stuck to the inside of a cabinet door. They prevent your doors from slamming loudly against the cabinet frame when being closed. When you peel these off, you will most likely have a sticky, adhesive residue left behind. If your cabinets are a few years old, that residue will have most likely hardened into a dry, papery lacquer. You won’t be able to feel it, but it’s there and will most definitely interfere with your paint results. It will ultimately soften under the primer and paint and eventually separate from the wood, causing a bubble or chip in your beautiful finish. So, scrape off that bumper adhesive! Rubber gloves are going to be your friend throughout this whole process. A strong degreaser will dry your hands out like nobody’s business. So, protect your skin and wear gloves when using a degreaser. When sanding primer, the sanding dust will get into the grooves/lines in your hands and really, REALLY dry them out. Even washing them and using lotion doesn’t help. It’s almost as if the primer dust creates a waterproof barrier that makes your hands feel like they are coated in chalk. Do you and your hands a favor by wearing gloves when you are sanding. 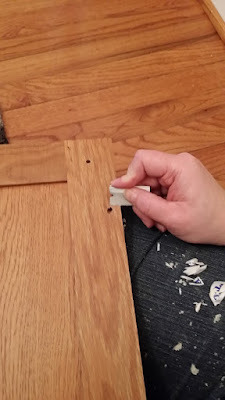 Those hinges are most likely coated in graphite, which is a dry lubricant powder that makes them work easily; however, that graphite powder is the equivalent of burnt charcoal dust smeared on your newly painted cabinet doors. It gets everywhere and took my husband 2.3 seconds to get black, smudgey fingerprints all over my barely dried, pristine white cabinet doors. Also, there is a chance that your door hinges might be greased or have grease/food stains on or in them, and these will mess up your door finish too. Wear gloves to keep your doors clean. 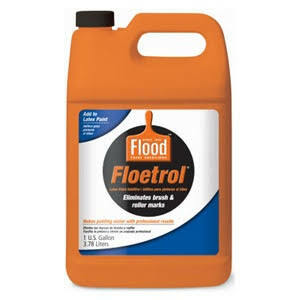 Flotrol is your next best friend. Flotrol is an additive that is used to help thin out latex paint so it will level smooth like an oil paint, as well as give you additional drying time. Sometimes, you will need to go back over a spot with your brush and roller. If it has already started to dry pretty well, going back over it will ruin your finish. Flotrol gives you extra time to smooth out blemishes before your paint starts to dry; therefore, preventing drag marks left by your paintbrush. NOTE: It's VERY important to shake the bottle of Flotrol well before mixing with your paint! When painting, please be aware that just because the paint is dry, it does not mean that it has cured. 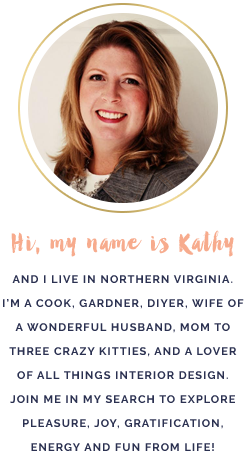 What is the difference between drying and curing? Drying time, which is usually 8-12 hours after you apply paint, is the time it takes for the paint to dry to “finger touch”. Although the paint is dry, it will still feel a little tacky and rubbery. Curing time, which can be anywhere from 7-30 days after the paint has dried, is the amount of time it takes for paint to harden and resist chips and peeling. Your beautiful paint job is at its most vulnerable between the drying and curing time. Until the paint fully cures, be very, VERY careful not to bump, scrape, or ding your cabinets. Be hyperaware of how you move about your cabinets during this time. I invested in a very important task light went painting my cabinets. This light helped me spot drips or build-up of paint that I couldn't see using direct lighting, or sanding dust that I missed after cleaning. The light casts shadows, which make drips and debris show up easier. This is VERY important if you are painting white-on-white like I did. I think you can buy one of these from Home Depot or Lowe's for around $35. 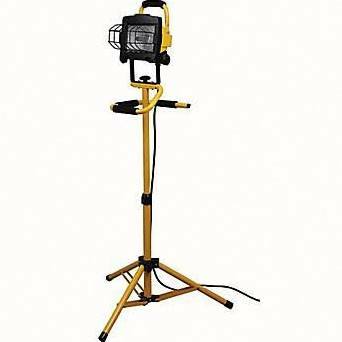 A task light will help you immensely! Okay, this might be a given, but I learned the hard way to NOT paint inside the routed-out holes for my door hinges. On the first set of doors I painted, I did that and the hinges were a complete PITA to get back in. From then on, I left the inside of the routed hinge holes non-primed and non-painted! So much easier! 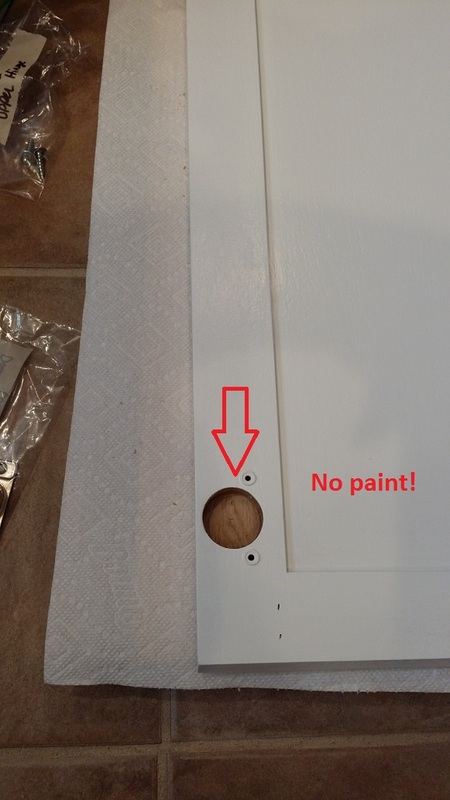 Don't paint inside the routed hinge holes! That's all I have for now outside of all the usual tips. Stay tuned for my next post, which will include some "How-To" videos!